Hello Friends! Thanks for tuning in for another cavalcade of cuteness! We love writing these "Family of G&O" posts. They give us a nice chance to show off! 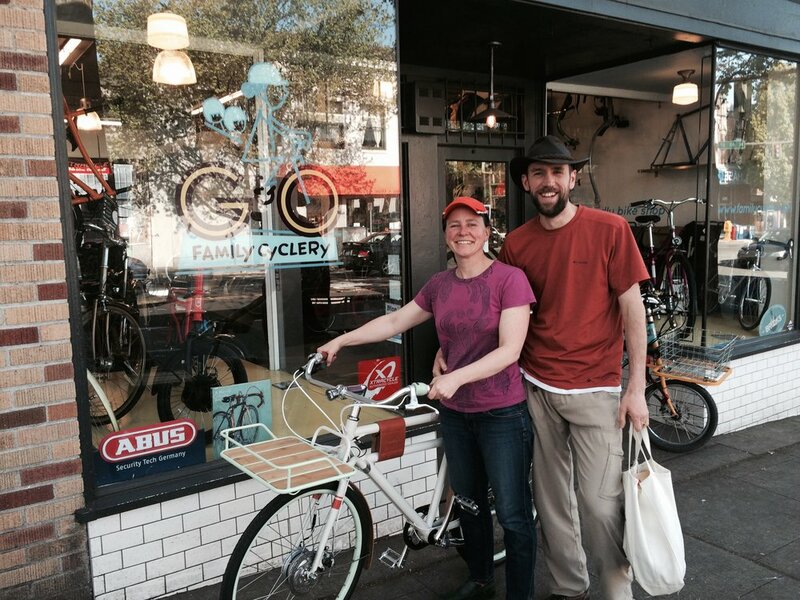 At G&O, our bikes are useful and great-looking and so are our customers! Spring in Seattle is underway. The shop is buzzing and lots of lucky folks are getting out on new cargo, family, electric and folding bikes! Yay! Here are a bunch of photos of nice people with their new bikes. Bicycle Lawyer Bob on his new Faraday Porteur. What a lovely bike! Nice Brompton folding bike, Clayton! Brompton, plus the Pere Chair kid's seat. An amazing combo! We can install BionX e-assist on all sorts of bikes. This one came out great! We sure do love the Xtracycle EdgeRunner. What a family bike! This is John, his kids, and his family's very custom Larry vs Harry Bullitt. This bike features BionX D series e-assist. The toboggan-style, single-file seating achieved with local custom metal work from Cyclefab and a pair of Yuba Rings. This is "the Dragon," a customized electric Metrofiets. It features a G&O-designed e-assist system with a powerful front hub motor. A torque-sensing bottom bracket provides smooth, proportional pedelec controls and a very streamlined look. Carl, the bike's owner is a very clever fellow and he figured out what might be the best boxbike/ infant carseat combo ever! (not endorsed by our bike shop) Cool! Doug rode up to the shop to pick up his G1 electric EdgeRunner and towed his own bike home! First day as a cargo biker and already doing the bag and drag! Bike Friday Hauladay with Car Sick Designs bags! God, the Bullitt is a nice bike. Brompton folding bikes are a family affair. This bike moved to British Columbia, where is delivers sandwiches for homeless and street-involved folks! Clare on the amazing Juiced Rider! What a delightful little cargo bike! Cargo bikes make us happy, too!